Embrace your inner-artist this summer! The Tett Centre for Creativity & Learning is delighted to offer an immersive 1-week summer program for kids ages 8-13 years old, in our arts-enriched, heritage building on Kingston’s waterfront. Registeration is now open!! Learn more about our resident artists in the Tett Creativity Studios! Located on the 2nd Floor, Room 214. We are currently booking for 2019 and 2020, contact us today! The Tett Centre for Creativity and Learning operates a heritage building on Lake Ontario's waterfront. It originally formed part of the Morton Brewery and Distillery Company, which was built in the mid-19th century. 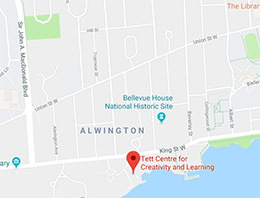 Location details for The Tett Centre for Creativity and Learning in Kingston. What's happening at The Tett? April 8th through May 5th. The Tett Centre For Creativity and Learning is an independenly operated Not for Profit, charitable organization. We are a welcoming destination in a city-owned heritage building where artists, arts organizations, and the community can come together to explore, create, and be inspired. Donations to The Tett assist in the promotion of Kingston’s arts and culture education, and play an important role in helping us to improve access to a wide range of arts experiences to enrich our community. From the Rehearsal Hall, the Tett Gallery and Activity Room, or the Malting Tower banquet room that seats 100 people in a gorgeous setting, the Tett Centre is an ideal venue to host your event or activity.